Since bursting onto the DIY scene last summer, Hinds – Ana Perrote, Carlotta Cosials, Ade Martin and Amber Grimbergen – have mastered a raw and playful sound all their own. With just a handful of released singles under their belt, Hinds have already earned early support from BBC Radio 1, BBC 6Music, NME, Guardian, Beats 1, Pitchfork, Rolling Stone, The Fader, Gorilla vs. Bear, and many more. 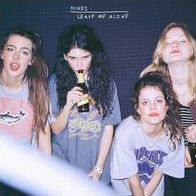 Kicking things off with their single ‘Garden’, Hinds take us on a bad* rock ‘n’ roll ride on Leave Me Alone. Weaving sun-kissed, ’60s inspired melodies, executed with a genius call and response between co-vocalists and band co-founders Perrote and Cosials, Hinds create the ultimate soundtrack to the best day ever – from start to finish – spent with your four best friends. In addition to previously released fan favorites including the band’s first-ever single ‘Bamboo’, ‘Castigadas en El Granero’ – which translates in English to Grounded In The Barn – and the band’s first new song of 2015 ‘Chili Town’, Leave Me Alone only gets better with each song. Featuring bright surf-pop tune ‘San Diego’, the mixed-tempo ‘Fat Calmed Kiddos’, and a bitter ode to sh*ty boyfriends in ‘And I Will Send Your Flowers Back’, Leave Me Alone is guaranteed to bring the Mediterranean sun to you wherever you are in the world at any time of the year.